Ingredients: Venison, beef, salt, water dextrose, brown sugar, spices, onion powder, garlic powder, sodium nitrite. Starts out with a light salt, but soon bringing in touches of garlic, onion, and black pepper. The black pepper becomes more defined in the chewing. 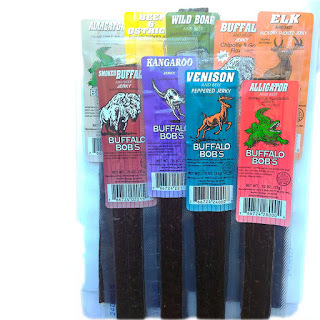 The natural meat flavor is more sharp and pronounced than Buffalo Bob's Beef variety, but not quite the gamey flavor that venison is known for. Ingredients: Kangaroo, beef, salt, flavorings, dextrose, brown sugar, dried molasses, onion powder, garlic powder, sodium erythorbate, sodium nitrite. The first impressions is the kangaroo meat flavor with a bit of salt, onion, and garlic. The chewing brings on a bit more salt and seasonings, while the natural meat continues to deliver its taste. Marked "Spicy" on the label, the first flavors is a light sweet and a touch of chipotle pepper. The chewing brings on more of the chipotle, while faints notes of garlic are detected. The natural meat flavor remains mild and light. The level of heat is low, rating a "mild medium" (level 2 out of 5) on our personal heat scale. The first flavor is a light salt and faint notes of garlic. The chewing brings on a bit more salt. The natural meat flavor is light, almost hard to identify. There's actually a light "buttery" character to this, distinct from the Buffalo Chipotle & Garlic (above). No smokey flavor could be found. Begins with a light gamey flavor, and a little more oily than the other varieties. The chewing brings in some saltiness, along with touches of garlic and onion. There's note of sweet in this too, and a light black pepper. One of the better varieties in terms of exotic meat flavor. However, no smokiness detected. It starts with a light salt, and soon reveals bit of garlic and onion. The chewing brings on some natural meat flavor along with a bit of black pepper. The meat flavor is mild, but still a touch more distinct from the beef and buffalo varieties. Does not taste anything like barbecue, however. Definitely a noticeable meat flavor right away. The chewing brings in more of that flavor, along with some salt and black pepper. The meat has a more sharp flavor than beef, and maybe this is comparable to the Elk variety. However, no hickory smoke flavor could be identified. The first thing I pick up is the alligator meat flavor, with a bit of salt. The chewing brings in more the alligator and salt, but also a bit of black pepper. The garlic and onion is lightly noticeable in the background. The advertised Cajun flavor, however, is not to be found. Has the same immediate alligator meat flavor as the Cajun variety (above). The chewing brings on some salt, garlic, and onion. This jerky tastes a bit more mild overall, however. Yet, it doesn't deliver any kind of Barbecue flavor as advertised. Ingredients: Beef, dried apples, dried apricots, dried papaya, raisins, salt, brown sugar, dextrose, spices, dry molasses, dehydrated onion & garlic. Initially has a faint fruity flavor with bit of tanginess, but soon brings in a little bit of salt and garlic. Has a very mild natural meat flavor. All of these sticks have a fair amount of chewiness despite the use of different meats. If anything, the alligator was the easiest to chew through. They all have a rubbery character, and tend to chew crumbly at first. The Venison was probably the most meat-like. The Elk was the most oiliest to handle. The Venison was my favorite of this bunch. It has the best combination of meat flavor, meaty chewing, and overall best jerky flavor. The Alligator, both Cajun and Barbecue, were my second favorites, also due the more noticeable meat flavor and decent chewing. The Kangaroo has some good meat flavor as well, as was the Elk, but didn't offer any meaty chewing, they were more crumbly. The others tended to have weaker meat flavors, crumbly chewing, or just didn't strike me anything special. Thanks to Jerky-King for sending us review samples!